Who used 3D playback anyway? Nintendo is making moves to remain relevant in the shifting landscape of handheld gaming. That is, to some degree, what the Nintendo 2DS handheld console is all about. Because this handheld is something of an oddity. Why? The clue's in the number of the name; the 2DS is the latest in the 3DS line, only it drops the key concept from the range: the 3D autostereoscopic display. Many argue that the 3D slider control of the 3DS is something that's seldom used, so perhaps the 2DS is on the money for what most gamers want. In our view, however, it's all about actual money. With the likes of mobile gaming on smartphones and tablets ever strong, a Nintendo handheld has got to appeal on the price front in order to survive in the market. Is the 2DS as confused as Nintendo has somehow made it sound, or does this £110 handheld own its rightful place in the 3DS lineup? It's not just the 3D display that's gone, the 2DS also ditches the iconic clam-shell folding design of the 3DS. Instead it's a flat design - near two dimensional, you might say - that looks a bit like an "always open" 3DS. Visually it doesn't look like it would be at all comfortable to hold - something that we were really concerned about when looking at the images of the console after it was first announced. But after a long weekend of gaming we've come to think that it's not so bad in the hand. We found everything fitted in its right place for our hands. But that's us; we do wonder whether that will be the same for younger players with smaller hands - and that's a clear target market. The fact the 2DS is an extra centimetre wider than the original 3DS doesn't shout of ergonomic brilliance, as the lower portion of the console does press into the palms a touch. Not uncomfortably so, but we can't help wondering what it'd have been like if it tapered off a little towards the lower portion of the design. The non-folding design might make sense as an ode to the 2DS's name, in order to separate it from the clam-shell 3DS aesthetic, and yet this very inability does makes it a pain to carry around. Our pockets certainly aren't big enough and there's something altogether less cool about it than a Gameboy from back in the day. It just ain't pretty. There, we said it. The 2DS can play 3DS games and DS games just like the rest of the line, so there's no difference there, and other than the new design there are few feature differences elsewhere. Indeed the features are nigh on identical to the 3DS from back in 2011. That means a 3.53-inch play screen up top with a second 3.02-inch touchscreen down below. The same motion sensor, gyro sensor and included stylus are included for all the in-game physical actions that you may need to perform. There are also the two rear and one front-facing cameras on board - although we're not entirely sure why the 2DS needs the dual rear cameras as a 2D device. Games fit neatly into the screen display, although it's not large by today's standards and its 800 × 240 pixel resolution is low given how far resolution has come in recent years. There's no point in a higher resolution screen though as the games aren't made with that in mind, but it goes to show how Nintendo has slipped behind the curve time and time again when it comes to finery such as resolution. Despite the 2DS's inflated footprint, Nintendo hasn't taken the opportunity to bolster the handheld with upgraded battery life. It quotes a 3.5-5.5-hour battery life when playing 3DS titles, and we did get around 5-hours out of the device fresh out of the box. But surely, and without the 3D parallax, there was scope to make this considerably better? In doing so Nintendo would, perhaps, have ceased to sell as many 3DS units, which is probably why the 2DS is on the back foot here. There's no auto power saving mode mode now either, instead just a Sleep switch that you'll need to remember to tug - we forgot once or twice when distracted and that costs battery life yet more dear. Oh, and one nugget of useful information: the 2DS does come with a power adaptor in the box, something that the 3DS XL absurdly lacked. Yet more of a clue that this latest venture is all about attracting in brand new players. When we first reviewed the 3DS back in 2011 it was one of those "will it, won't it?" kind of reviews. It was hard to judge where it would go. Two years on, and with plenty of quality titles under its belt later, and the whole 3DS family certainly shows its worth. Or, at least, it will for some. If you're a sucker for Mario, Luigi and the like then there are some Nintendo productions that are fun to play. We've been plugging through Luigi's Mansion 2 and, despite its repetitive gameplay, we've found ourselves happily revisiting the title day in, day out. But there's one - well, two - titles that the 2DS is clearly geared up for. Pokemon X and Pokemon Y weren't casually released on the very same day as the 2DS went on the shelves. This is Nintendo keen to push its biggest franchise out to the masses ahead of the Christmas period. And if you're a fan of the series then that's no bad thing, we suppose, as special bundles of console plus game plus carry case can be bagged for under £150. Still, if you're more of a Real Racing fan than Mario Kart 7 player then the whole 3DS family might never make it onto your radar. Such is the strength of mobile device gaming, something that's surely making Nintendo feel the pressure. The Nintendo 2DS is a stroke of genius as much as it is a stroke of necessity. A 3DS minus the feature that anyone barely uses - great. A handheld that'll make buying Pokemon X & Y accessible to a wider audience - very shrewd. A more budget entry in a market where smartphone and tablet games are eminently more affordable - it's something Nintendo had to make happen. But the 2DS is just a bit ugly. Its inability to fold up like the clam-shell 3DS means you can't slip it into a pocket, and no carry case is included in the basic purchase. The wider-than-3DS design and necessity to handle more of the device's height when playing might also not suit smaller hands. And the battery life offers next to zero improvement over the original 3DS from back in 2011, and this is without the 3D feature. 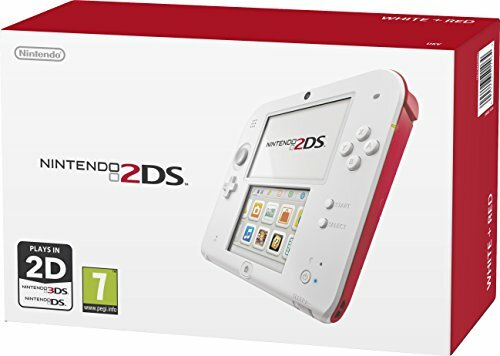 We're fans of some 3DS games and if we were on a strict budget then we'd certainly consider buying a 2DS. Make no bones about it: there are 5-star 3DS games out there, but you'd be best off with a 3DS XL to get closer to the five star play treatment. For us the 2DS bounces somewhere between shrewd by concept and slovenly by design, thus we've ping-ponged its score down a reflect that. However, when all's said and done, it's the games that will sell it. And this is a Pokemon peddler if we ever saw it, which speaks for itself. Touch‪é‬ Nintendo.